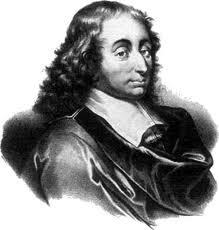 Blaise Pascal was a 17th century mathematician and physicist, who also lends his name to a [somewhat] unfortunate programing language. Aside from the scientific realm, he also played a bit in the area of religion. Everyone must choose whether or not God exists, there is no neutral stance. Because one must choose, it is only logical to weigh the pros and cons of each possibility. If you choose to believe that God exists, then there are two possible outcomes: 1) God exists and because you believe you will spend eternity in bliss, and 2) God does not exist and death is the end (your belief had no positive or negative gains). If you choose not to believe in God there are two possible outcomes: 1) God exists and you are eternally damned, and 2) God does not exist and death is the end (your disbelief has no positive or negative gains). The two outcomes for belief in God are a net gain, and the two outcomes for not believing in God are a net loss. Therefore, it is only reasonable to wager/bet on a belief in God. Growing up in the Bible belt, I heard a similar argument from my fellow Christians on a regular basis. They would explain to people who did not share their belief that “if I am wrong, then I’m still going to be ok; if you are wrong, you are going to hell.” While I understand (and agree) with the logic here, I always had some pretty serious problems with this line of reasoning. There is a difference in stating belief and actual belief (or faith). Simply because a person says they believe in God does not make it so. Pascal said that even someone that did not believe in God should live as if they did believe, and through their actions they would eventually come to true belief. I personally believe that this idea is a bit nieve; and that simply willing yourself into belief is an oversimplification of supernatural aspects of faith in a god. The second issue I have with this line of thinking is that it places the emphasis on a belief in God on a fear of eternal damnation. I have always had a big issue with theologies that place the primary motivating factor for a belief in God to be a fear of going to hell. It always seemed to me that while hell might be a consequence of not believing, it should not be the reason to believe. Pascal’s wager is the prefect example of what happens when you attempt to explain the supernatural complexities of God with human understanding. God cannot always be placed in the little box of logic and reason we’d like to place Him in. The very definition of something supernatural is that it is outside of the natural order and understanding of our universe.